Chestermere High School graduate Emma Gingras was rewarded for hard work and dedication she has put into showing her ewes. This year marked the eighth year that Gingras has been a part of the Calgary Stampede International Youth Livestock Scholarship. 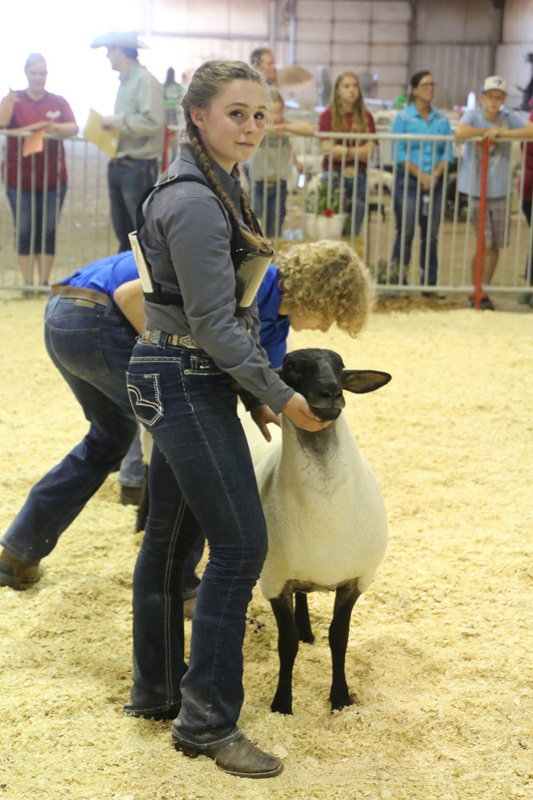 In order for Gingras to be eligible to win the scholarship she had to complete five components within the Summer Synergy competition, including marketing, conformation with animals, showmanship, team judging and multi-judging. “I am preparing for these events when I pick my 4-H projects in March. I prepare for conformation by keeping my ewes and lambs clean and trimmed,” Gringas said. A typical day for Gingras when she is preparing for conformation begins with taking her lambs for a 20-minute walk around her property. After the walk Gingras takes the lambs into a small pen and leads the lambs one by one by the head, as she would do during a show. “By doing this I got my project lambs and ewes used to the idea of being led by the head and me switching from side to side while leading them, Gingras said. For Gingras the most challenging aspect to competing in the Summer Synergy competition was finding ways to manage her time. “I had to make sure I had enough time to work on my marketing project while studying for my upcoming diploma exams and preparing for graduation events. “I also had to manage my time during the competition before conformation to make sure that my seven sheep were ready for show in between registration, trimming and multi judging,” Gringas said. Although it was challenging for Gringas at times, competing in the conformation was a rare opportunity she is excited to have experienced. “This event is a very unique opportunity to be with those in the agriculture community across the province,” she said. With receiving the Calgary Stampede International Youth Livestock Scholarship Gingras is going to attend the University of Lethbridge to become a Veterinarian, and also plans to volunteer in various clinics and help as many people as she can. “There are so many great memories and experiences that come with this competition. From preparing my ewes to receiving a scholarship, being interviewed and walking across the grandstand with my peers. “There isn’t one part that I can pick out that stand out from the rest. The whole show is a wonderful experience in itself and it is amazing to be rewarded for the amount of hard work that I have put in. “I’m ecstatic to be awarded with a scholarship,” Gringas said.